Happy New Year, lowercase L enthusiasts! I just got back from nearly a month abroad in Israel, only to find that this lowercase L blog has been listed on kottke.org as "the best niche blog yet"! So I figured I'd better get back to posting. I'll start off 2007 with a photo I took shortly before I left for Israel. 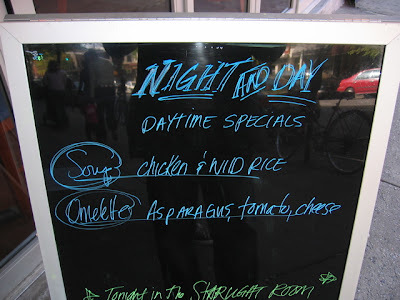 The difference between L's and i's should be as clear as day and night, but this menu board from Night & Day on 5th Avenue here in Park Slope proves this isn't always the case. Perhaps the author was raised in the WIlD, because no civilized human would write like that. Funny cuz they got the L in 'SPECIALS' right. This is a great niche blog, fyi. Oy, now I have Talking Heads stuck in my head. Good sighting, I don't know if I would have noticed that unless I was reading the menu.